Can the Happy Holidays Continue for Akamai Technologies, Inc.? The content-delivery giant saw much more video traffic than expected in the holiday quarter, halting a grim stock slide. What's next? Shares of Akamai Technologies (NASDAQ:AKAM) soared more than 20% higher on Wednesday morning, following a fantastic fourth-quarter report and a radical restructuring. But the stock is still trading at a large discount to historical valuations, and the road ahead may not be full of sunshine and butterflies. In the fourth quarter of fiscal year 2015, Akamai saw revenue rise 11% year over year to $579 million. Adjusted earnings jumped 5% higher to $0.72 per share. The yearly growth rates here have backed out the effects of currency exchange trends. Otherwise, sales would have risen 8% and earnings increased by 3%. Analysts would have settled for adjusted earnings of $0.62 per share on something like $561 million in top-line sales. Akamai left these estimates far behind. The company also exceeded the top ends of its own guidance ranges on both the top and bottom lines. And then there's the reorganization. The single-unit reporting structure will break down into a media segment and a Web department at the start of the upcoming second quarter. Looking ahead to the first quarter of fiscal year 2016, Akamai's management expects revenue of roughly $562 million. Non-GAAP earnings should land near $0.62 per share. These targets were roughly in line with Wall Street's current expectations. "This is a natural evolution of our company structure intended to help us better serve our customers and further accelerate growth," said Akamai CEO Tom Leighton in a press statement. The reorg also moved plenty of executive talent around to new positions, and the move should at the very least serve to increase the transparency of Akamai's business reports. The company also hopes that the new structure will help drive sales and manage customer relationships, but I'll believe that when I see it. Akamai keeps expanding its overseas operations. International fourth-quarter sales rose 17%, including the negative effect of a rising dollar. Backing out currency effects, the increase would have been more like 27%. Coming into the holiday season, management expected media services to fall short of the 2014 quarter's fantastic performance. Instead, the division crushed Akamai's internal expectations and was a core driver of the quarter's strong growth. And you could argue that the reorg is tailored to underscore just how strong this new segment really is. That being said, keep in mind that Akamai jumped up from a deep, dark well this time. As of Tuesday night, the stock had fallen 35% over the last 52 weeks and a blood-curdling 48% since the third-quarter report. Even now, Akamai investors are looking back at a one-year return of negative 21%. The stock is trading at very low P/E and price-to-cash-flow ratios today. That's great if you're looking to pick up a few Akamai shares, but remember that the prices include a heavy risk-based discount. Apple is taking a smaller bite of Akamai's services these days. Image source: Apple, edited by the author. Going forward, Akamai needs to find a way to stay relevant while some of its largest customers are building their own content delivery networks. Netflix is the most obvious example, having moved from relying on Akamai and its peers for streaming-video delivery to resting almost exclusively on its own Netflix Connect solution. Apple rolled out its own CDN in 2014, just months after also extending its Akamai contract. It's safe to say that these formerly large customers now play a smaller role in Akamai's annual sales. On the upside, very few businesses have both the technical and financial wherewithal of Netflix or Apple, and not every company can build and manage its own worldwide content-delivery system. But as other large companies follow these early trailblazers, Akamai must refocus on small and medium-sized businesses. That can be a fine target market, but these smaller customers are more price-sensitive. Expect profit margins to continue swooning in the coming years, as they have been doing since 2008. 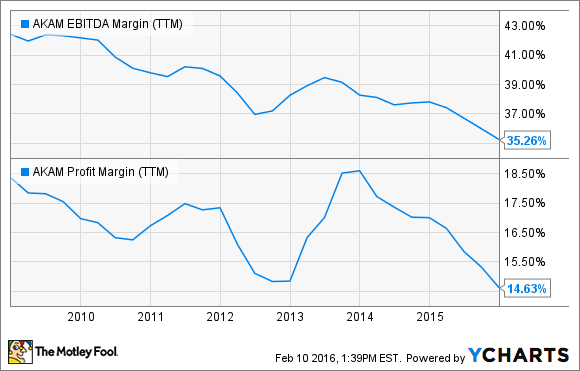 AKAM EBITDA Margin (TTM) data by YCharts.